Each day this week, I'm posting expanded content from my contribution to our church's weekly follow-up devotions. You may recall that the focus passage is Colossians 1:24-29, so although each day zeroes in on one or two verses, you may want to read the entire passage each day, for context and clarity.See end of post for full series content links. Most people love a good mystery. Not me. I want to love a mystery. But not knowing how a thing will turn out frustrates me to no end. I get nervous and anxious at every plot twist. No mysteries, no surprise parties, no “I’ll give you three guesses!” for me, thank you very much. This mystery, however? THIS is a good mystery. The Greek text uses the word mystērion here, to describe a hidden thing, something not obvious to the understanding. But this is something God no longer withholds from those who belong to Him – this mystery is revealed in Christ Jesus and is revealed in us, His children! 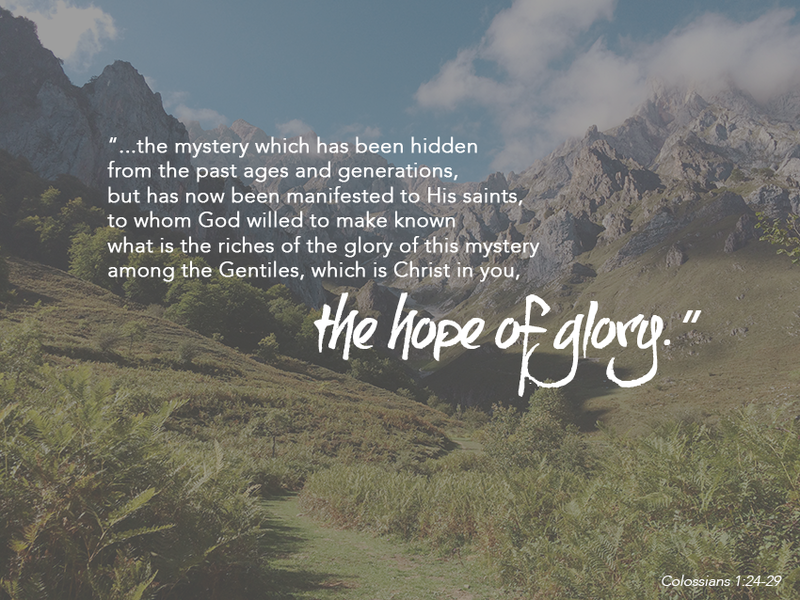 Christ in us – the very hope of glory! What was once a secret is now our precious treasure. The hope that is being worked out in us through suffering and perseverance yields a glory we cannot contrive. It is only the working of Holy God, through His Spirit. Paul was made a steward by God (v25) and it was God’s will that the riches of this glorious mystery be revealed (v27). The revelation of this mystery happens by God and for God and His glory. Hope is mysterious of itself, is it not? Paul writes again in Ephesians of this mysterious revelation..."we who were the first to hope in Christ would be to the praise of His glory". The hope he speaks of here is an eager expectation - something in which believers can have confidence. This is a hard concept for me, truly. I have long wrestled with this idea of hope – an eager expectation – a desire or desired outcome. I imagine we all have wrestled with this in different ways over the years. My struggle is simple: I have inadvertently begun to view Jesus Christ not as Hope itself, Hope Incarnate, Christ in me, the Hope of glory -- but as the facilitator of my little hopes, my expectations. It is difficult to lay those down. There is a tension in relinquishing my hopes to settle into the hope of glory. My life is no longer about getting all the things I hope for, the things I hope will result in a beautiful -even spiritual- life. My life is about the indwelling Christ and the resulting glory of the Father. I am finding that the blessed hope of surrender to Christ Jesus is, indeed, a mysterious tension of loss and joy. And you? Are you in the tension of that mystery? The precious treasure is being revealed and it often requires so much laying down. But the life of Christ in us, for us - what a gift! For Further Reflection: What do you hope for, temporally speaking? Have you allowed your hopes to become a wishlist you submit to God? Consider your view of God in light of this mystery: He allows us to be indwelled by His spirit. Our lives have become less about getting and more about abiding. Use your prayer time to praise God for this revelation and ask Him to make “Christ in you, the hope of glory” a richer and dearer “mystery” to you.